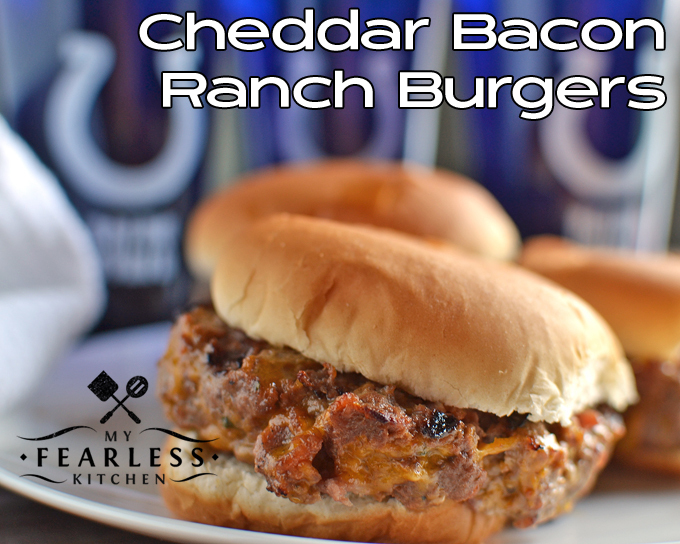 Take your burgers to the next level with these Cheddar Bacon Ranch Burgers. They are simple to make, but packed with so much flavor, everyone will love them! We love bacon. And we love cheese. And we love beef. And, really, almost everything is a little better with some ranch flavor. The folks at the Colts Best Tailgate Contest asked me to come up with some fun tailgating recipes, and I knew this would be perfect. 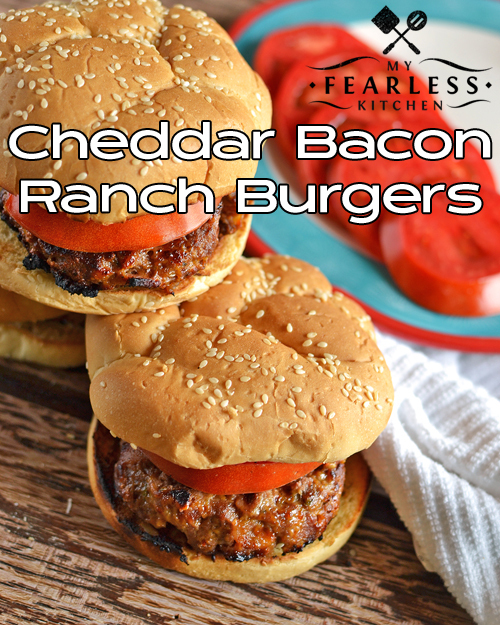 You just can’t go wrong with these Cheddar Bacon Ranch Burgers – you get all the good stuff in one yummy package! There are a few tricks to making these burgers come out just right. The first trick is to use the right meat. You’ll want to use a mid-range ground beef for these burgers (something in the 85-90% lean range). Ground chicken and turkey have so little fat that the patties won’t hold together. Leaner meats also stick to the grill, and the cheese is going to give us enough sticking problems! And don’t worry if your ground beef is a different color on the inside than it is on the outside – that’s perfectly normal. The ranch dressing mix makes these burgers just a tiny bit dry. A dry burger will fall apart on the grill, and we don’t want that! Add in some Worcestershire sauce and water when you’re mixing the ground beef to make sure the burger patties have enough moisture. Dive right in with your hands to mix everything together. That really is the easiest way to get the ranch mix, Worcestershire sauce, cheese, and bacon mixed evenly with the beef. I used to hand-make all my burger patties. It was fun, but I could never get them quite even or quite round, and then they didn’t cook evenly. This burger press is so easy to use, and makes it a breeze to get evenly sized and shaped burgers. Using a burger press for these patties also means that you can get them packed nice and tightly. And, you guessed it, a firmly packed burger patty is less likely to fall apart on the grill! The last trick is actually on the grill. Using cheese mixed into the burger patties means the burgers will stick to the grill a little bit. Preheat the grill to medium, then oil the grates. (Pour canola or vegetable oil on a paper towel, hold that in some tongs, and rub the grill grates. Be generous with the oil, but be careful of flame ups!) Put the burgers on the oiled grill. After about 2 minutes, use a spatula to gently loosen the burgers from the grill, but don’t flip them just yet. They need to cook a little bit longer before you flip them, or they will fall apart. Cook the burgers for 3-5 minutes on each side (turning once, carefully), until the internal temperature reaches 160 degrees F.
What’s your favorite way to enjoy a hamburger? How Can I Tell if My Propane Tank is Full? 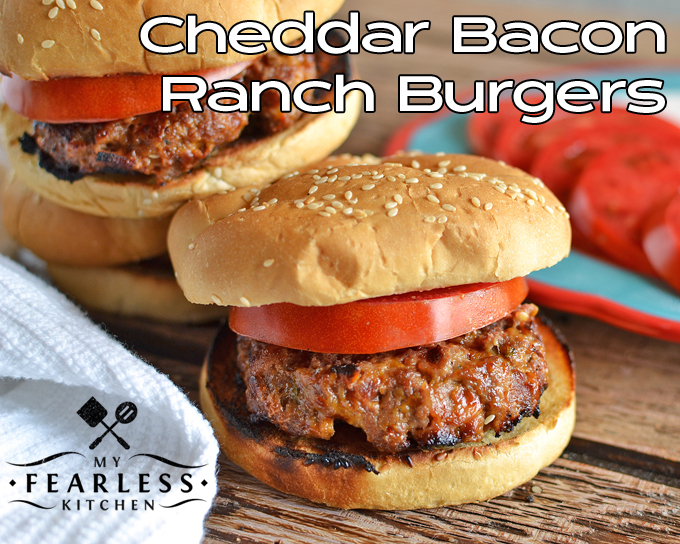 Take your burgers to the next level with these Cheddar Bacon Ranch Burgers. They are simple to make and packed with so much flavor, everyone will love them! Combine all ingredients in a large bowl. Using your hands, mix until all ingredients are thoroughly incorporated. Form beef into 4 patties (approximately 6-1/4 ounces each). I used a kitchen scale to measure the hamburger mixture evenly, then used a burger press to form the patties. Preheat grill to medium, and oil grates (the cheese in the patties will make the burgers stick to the grill). Grill burgers for 3-5 minutes per side, turning carefully once during cooking. Cook burgers until the internal temperature is 160 degrees F.
Toast buns on the warm grill, and serve immediately with a slice of tomato and any other toppings. I finally made these burgers! They were easy and delicious! My family and I really enjoyed them. I was on auto pilot, however, and pre-cooked and crumbled my bacon. I went ahead with this and mixed it into the burgers, and it was just fine. Didn’t ruin the burger at all. I cooked a whole package of bacon, crumbled the four strips for the burger mix, and then we used some strips of bacon to top our burgers with. Can’t have too much bacon! So if you accidentally pre-cook the bacon like I did, don’t worry, it’ll be fine! I’m glad you liked the burgers! And glad to know that using pre-cooked bacon worked, too! This would be a great way to use up leftover bacon from breakfast…. if you manage to have any leftover bacon, that is!